On Saturday, May 4, 2019, Preservation Texas invites you to celebrate National Historic Preservation Month with a visit to our Bassett Farms Conservancy located in Falls and Limestone counties near Kosse, Texas. We will be dedicating the Texas Historical Marker at the 1875 Bassett House, while offering an opportunity to tour the farmstead, enjoy a barbecue lunch and participate in a conservation workshop. Weather permitting and depending on the condition of Sulphur Creek, there will also be an opportunity to hike to the largest of our nineteen ponds. Click here to register today! There is no cost to attend the dedication, tour the grounds or participate in the conservation workshop. However, donations will be welcome to support our preservation and education efforts at the Conservancy. We are especially grateful for the support and enthusiasm of our friends at the Limestone County Historical Commission and the Falls County Historical Commission who will be joining us at the farm! The event will include an “open house” showcasing the unrestored historic Bassett House (first floor), period outbuildings (dairy, bunk house and cotton seed shed), the Conservancy office and library, the farmhouse grounds as well as selected artifacts and UT Austin School of Architecture studio projects focused on the Conservancy. Before you go, watch a short video about Bassett Farms Conservancy here. An optional lunch from Whup’s Boomerang Bar-B-Q, a Marlin (Falls County) favorite named by Texas Monthly as one of “The 50 Best BBQ Joints in the World,” can be ordered in advance for $15 with your registration and will be served in our Pole Barn. Alternatively, you may bring your own picnic lunch to enjoy on the lawn. Cold drinks may be purchased separately at the farm. Opportunities for hands-on learning will be available, too. Visit our Facebook event page for updates. Click here to register today! The 2,400-acre Bassett Farms Conservancy is the property of Preservation Texas, a gift of the late Willie Ford (Bassett) Sparkman. 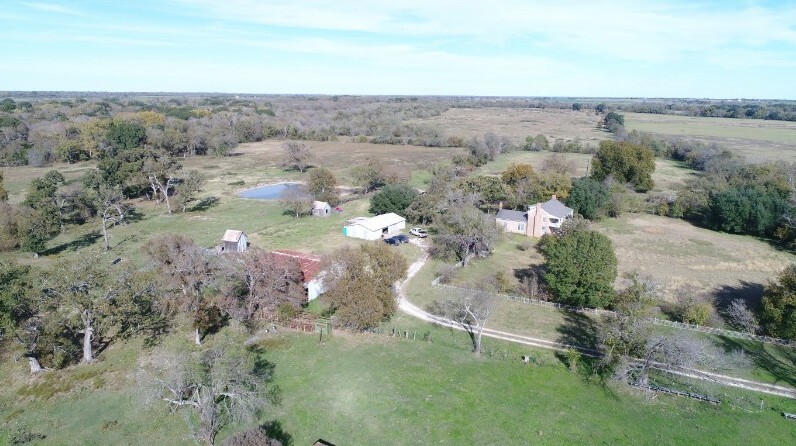 Preservation Texas is developing the historic farm and ranch, established in 1871 at the headwaters of the Little Brazos River east of Marlin, Texas as what will be the largest preservation and conservation skills training center in the country. The 2-story brick Bassett House (1875), thought to be the oldest brick house in Limestone County, was built by Henry Bassett and has been the center of farm and ranch life at Bassett Farms for nearly 150 years. The Bassett House has been designated a Recorded Texas Historic Landmark. For a video about Bassett Farms Conservancy, click this link. General Admission is FREE for the tour, marker dedication and conservation workshop. The barbecue lunch will cost $15.00 per person and must be ordered in advance. Lunch will include your choice of barbecue meat (brisket, chicken or sausage), two sides (potato salad, cole slaw, baked beans or green beans), peach cobbler and a drink. Lunch quantities will be limited so register early! Bassett Farms Conservancy’s physical address on Google Maps is 1343 LCR 666, Kosse, Texas 76653. However, LCR 666 has recently been renumbered as LCR 667. Look for the blue “Preservation Texas Event” directional signs on Highway 7 near the farm. The farm is a 2-hour drive from Austin, Dallas and Fort Worth; about 2.5 hours from Houston; and just over 3 hours from San Antonio. The 2-story brick farmhouse and grounds are located about 3 miles northwest of Kosse at the center of our 2,400 acres, just over the Falls/Limestone County line. This is a rural landscape and please note that once you leave Highway 7, the roads are unpaved gravel surfaces. Drive carefully, particularly near blind corners. Watch for wildlife. On-site parking will be provided in a field adjacent to the Bassett House on a first-come basis. Overflow parking will be along the country road near the house. This is a casual event, and the weather may be warm, so dress accordingly. There is no air conditioning in the Bassett House or in the Pole Barn. Please wear comfortable walking shoes and plenty of sunscreen. The house is unrestored and the grounds are in a natural state with minimal improvements. Weather permitting and depending on the condition of Sulphur Creek, there will be an opportunity to hike to the largest of our nineteen ponds. Bring your camera! On Instagram we are @preservationtexas and @bfc1871 — use the #BassettFarms hashtag for your images. And while Bassett Farms is photogenic, any commercial uses of photographs taken at Bassett Farms Conservancy are prohibited without the prior express written consent of Preservation Texas. Aerial drones are prohibited. Bring a blanket or some folding chairs for the marker dedication in the front lawn. Enjoy a picnic lunch on the lawn or eat at one of the tables in our pole barn. Smoking is prohibited except in the parking area. Cigarettes are to be disposed of properly and shall not left on the ground.